The Houston Fire Department was established in 1838 with one station, Protection Company No. 1. It grew to a volunteer fire department status with three stations by 1859. After having provided volunteer firefighting services for 57 years, the City of Houston Fire Department began paying its firefighters in 1895. HFD is the third largest fire department in the United States and is responsible for preserving life and property to a population of more than 2 million in an area totaling 654 square miles. Today's modern fire service is presently undergoing a transitional process. Over the last few years, HFD has evolved into a highly sophisticated public safety rescue system that has saved hundreds of lives and reduced the severity of countless injuries and illnesses. The Houston Fire Department has a vision that guides the organization towards excellence. That goal is achieved through deliberate planning, adaptability and the courage to embrace challenges and opportunities. HFD will be recognized as a premier public service organization, respected and admired by our peers and the community as the most diverse, innovative, and efficient public safety provider in the world. To continually evolve to meet our customers’ needs. We cannot stop growing. For instance, there are fire departments that felt they were in place to just run fire calls. They no longer exist and if they do, it is on a very small budget. We have always evolved; emergency medical services, hazardous materials, technical rescue, homeland defense are all services that we now identify as core services. The best we can be for our community. The key is to play to your strengths and play your position. How do we want to be seen/perceived? As professional, knowledgeable, nice and caring… as a part of the Community. How do we want to be treated by the Community and by each other? With respect, consideration, understanding, acceptance and care. There is a direct connection between the way we treat each other & our customers and the way we are perceived. We should understand, practice (train), implement and always ensure appropriate risk management. This is how we operate on EMS calls, fire incidents, driving, and around the station … Always. HFD exists to serve our citizens (the public). Our menu of responsibilities is ever changing, but our basic areas of service are prevention and enforcement, public education, pre-hospital emergency care & transportation, and fire control. Our service has evolved to include hazardous materials, technical rescue, tactical medicine, swift water rescue, and social service calls. We are the “one-stop” shopping that citizens can rely on. When they call we only ask a few questions, respond quickly, solve their problems, and leave just as fast as we arrived. No red tape on either end….no other government agency works in quite the same way. HFD at Fire SceneThe preservation of life remains the number one goal of HFD, beginning with the responder and extending to the public. Our citizens must be reasonably free from danger and harmful acts. With the best equipment and training, the department can reduce the risk to the public and its members at all emergency incidents. We commit to the health, safety, and welfare of our members, thus protecting them and enhancing capability and readiness. We aim to eliminate preventable work-related injuries and illnesses through the systematic management of our risks. Reliability- Our commitment to the public we serve is unwavering and consistent. This commitment is fully expressed in our motto: “Courage, Commitment, and Compassion”. Teamwork - Teamwork is the basis of our success. We work as a team because we value each other, the community we serve, and our commitment to the HFD mission. Dedication- The faithful observance of duty beckons us to fulfill our obligations professionally and honestly. Bravery - Courage is the foundation of our character. Bravery is the ability to overcome fear through fortitude, instinct, compassion for others and training. Courage- The mental and physical ability to face adversity with focus and determination. Commitment- The act of dedicating one's self, through total effort, to accomplishing the mission. In other words, commitment to your faith, family, and HFD. It is the type that never comes into question. Compassion- To be understanding, considerate, sympathetic, and kind hearted to others. The Houston Fire Department aspires to become a model department, setting standards for fire departments around the country. In 1998, the department prioritized the accomplishments necessary to achieve this elite status. Among its goals, HFD focused on the Insurance Service Office rating, a primary element used by the insurance industry to develop premium rates for homes and businesses. On a relative scale of 1 - 10, the ISO measures the capabilities of a fire department to control fires, thus limiting fire losses. The ISO raised the rating to a class 1 in 2002, effective April 1, 2003. Additionally, the HFD has taken steps to become accredited by the Commission on Fire Accreditation International - a self assessment graded by peers. 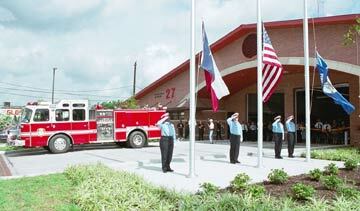 On March 24, 2001, HFD became the world's largest accredited fire department. 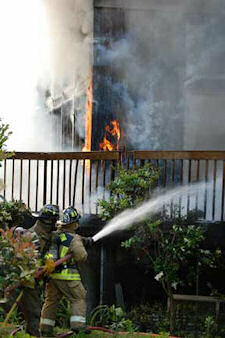 HFD’s most recent Accreditation occurred on March Safety- 8, 2011. These goals cannot be accomplished without the department's commitment to provide up-to-date gear, equipment, apparatus and to replace or upgrade inadequate fire stations.